Menton Daily Photo: A Village Wedding - "If Music be the Food of Love ..."
A Village Wedding - "If Music be the Food of Love ..."
Meet the three musicians who played whilst the apertifs were being served. The small photo shows them rehearsing earlier and with two of them falling about with laughter. Perhaps the one in the middle had played a duff note. 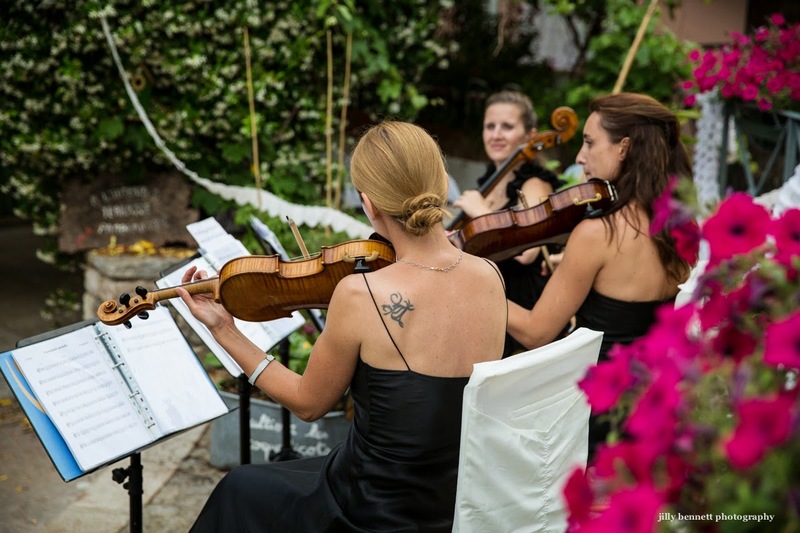 They played beautifully - wonderfully soft classical music that seemed to fit the atmosphere of these wedding celebrations. 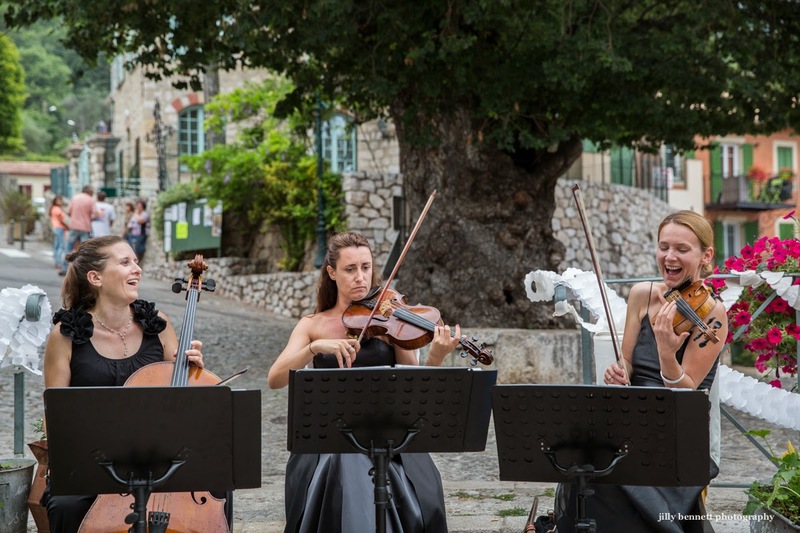 Voici les trois musiciennes qui jouaient tandis que les apéritifs étaient servis. La petite photo montre les répétitions un peu plus tôt avec deux d'entre elles qui rient. Peut-être parce que celle du milieu avait fait une fausse note. 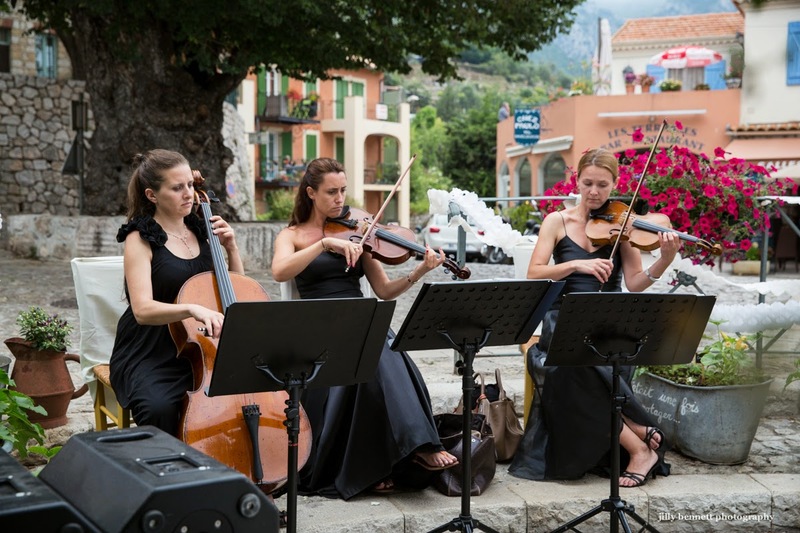 Elles ont joué magnifiquement - de la musique classique merveilleusement douce qui correspondait bien à l'atmosphère de ces célébrations de mariage. Excellent shots in each case. I like the body language of the musicians. For once, a tattoo that fits the person and the circumstances. I love all three photos but the top one is the most interesting from a composition and depth of field point of view. I love the idea of these three ladies playing live music there. I wish your blog had sound too!